But you can get £1 trial subscriptions, and this includes the iPad app, which gave access for several months for the price of one. Crucially, the 105k number is cumulative - spread over 4 months. After a frenzy of back-of-envelope arithmetic by every hack in London, the answer was clear as mud. 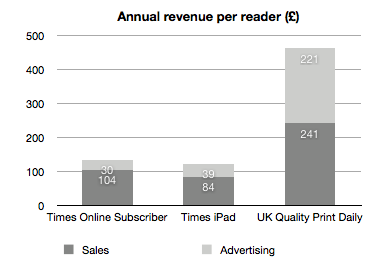 Every ‘senior, well-connected correspondent’ seems to have different ‘inside’ numbers: The Times has 10k iPad users. Or 35k. No, 20k. How many of that 50k subscribing transactions were repeats spread over 3-4 months? Are there 50k subscribers or 10k? Were they all discounted trials at launch or has use increased? How does this match Nielsen’s estimate of 350k uniques? The end result is a hideously wide range. In the initial heady moments after the press release it looked like the Times was reporting £12m a year. Once people read the bits about ‘half subscription’ and ‘cumulative’, that turned into a range somewhere between £1m and £8m. No-one outside NewsCorp really knows which. All of this brings me, though, to the chart at the top of this post. The Times paywall might have 100k paying customers or it might have 10k - but each of those users is worth perhaps a quarter as much as a print customer. Something else is needed.